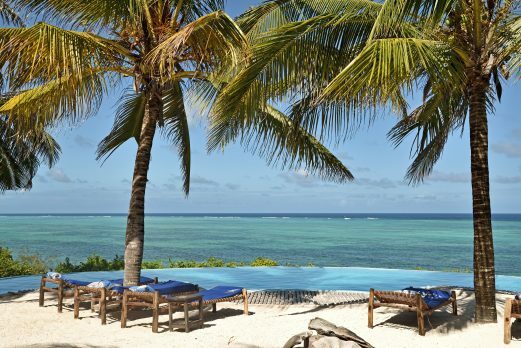 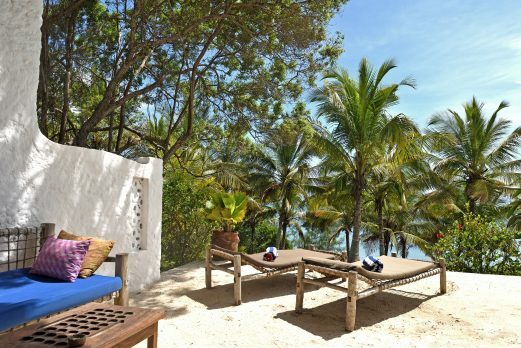 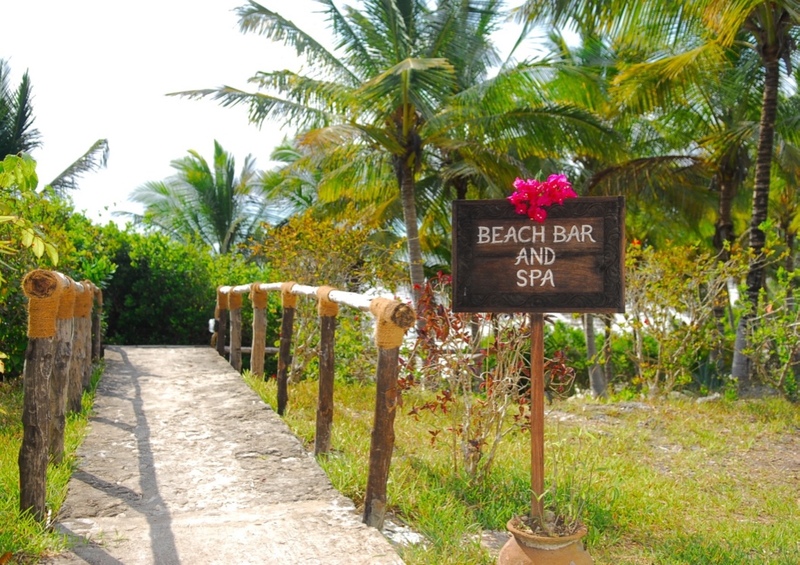 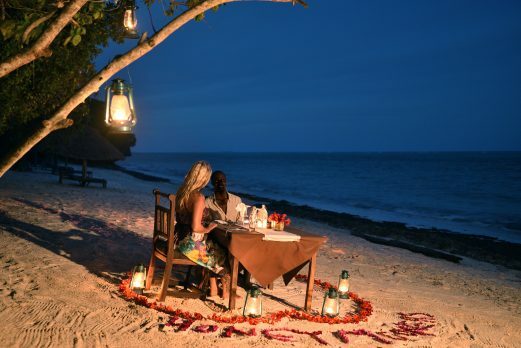 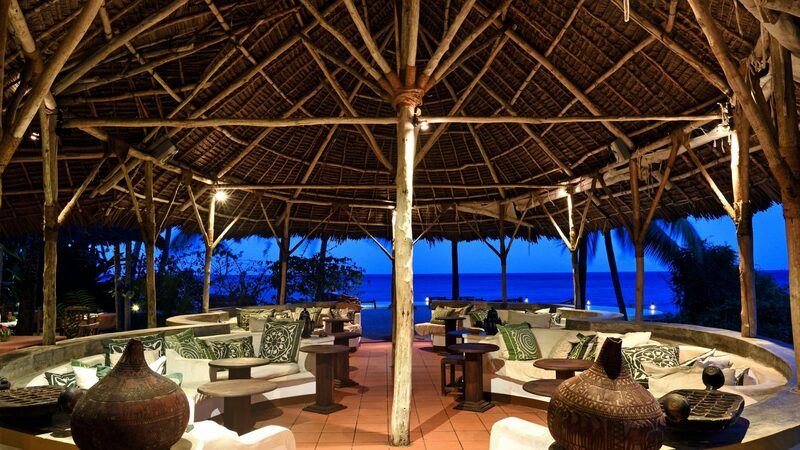 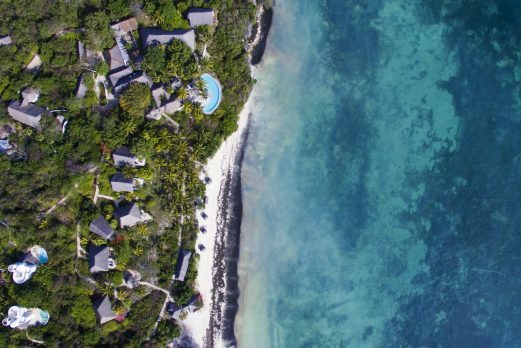 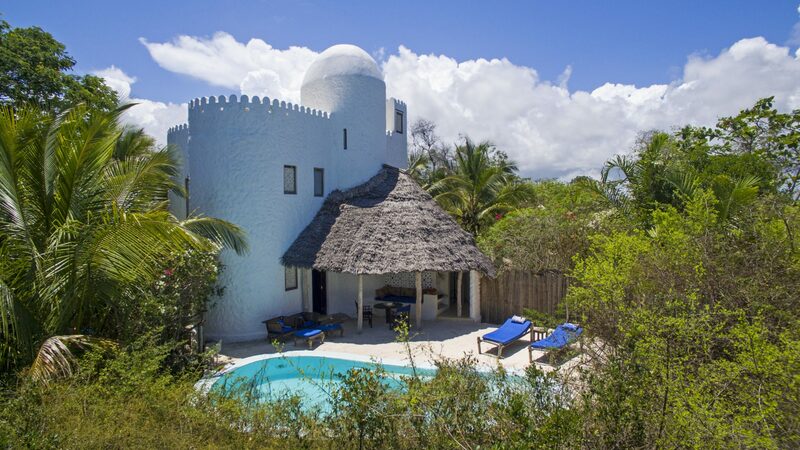 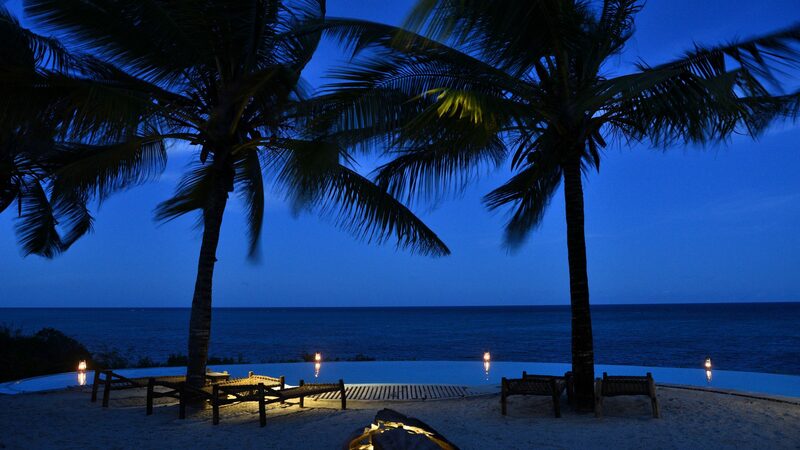 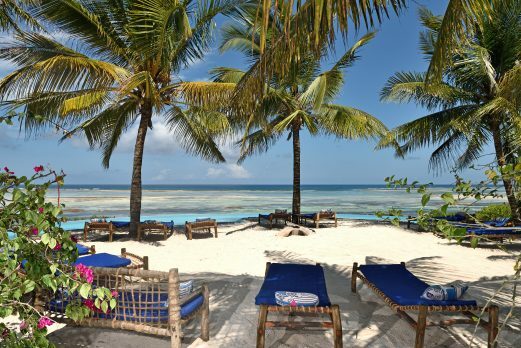 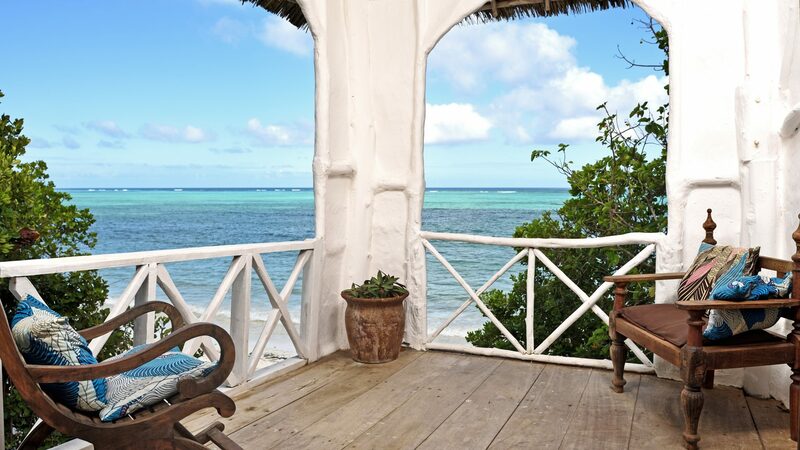 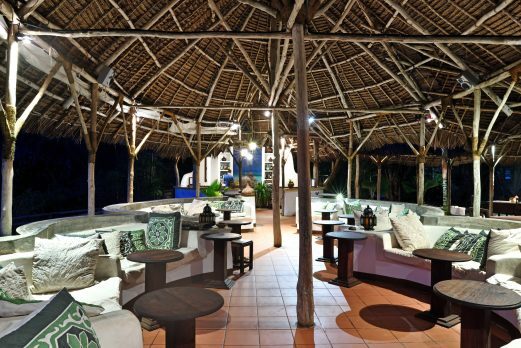 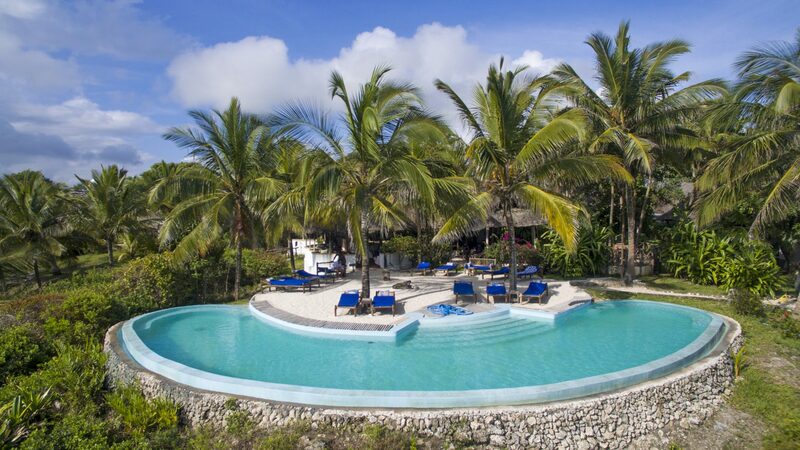 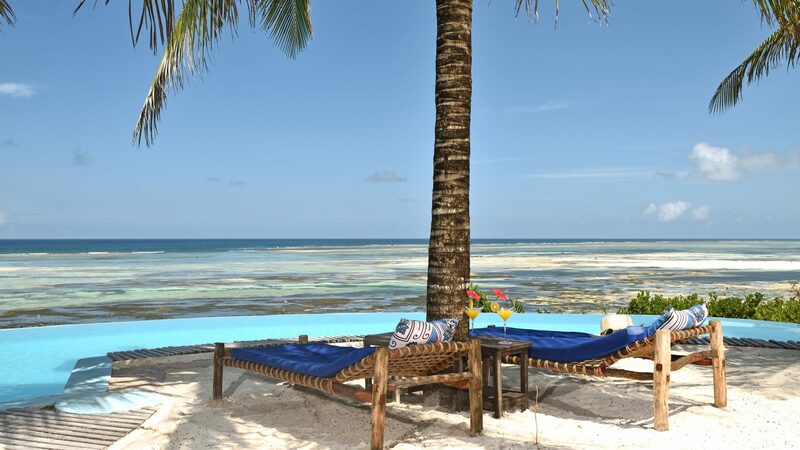 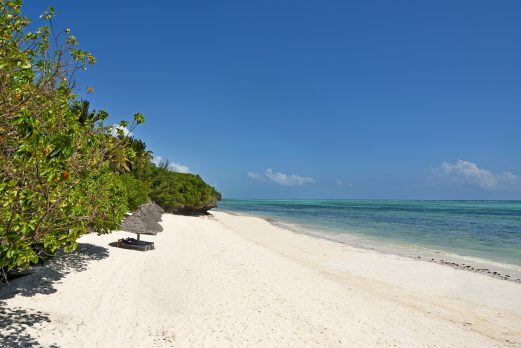 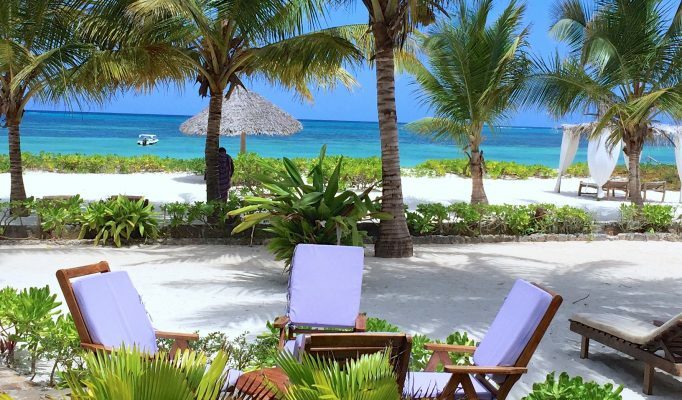 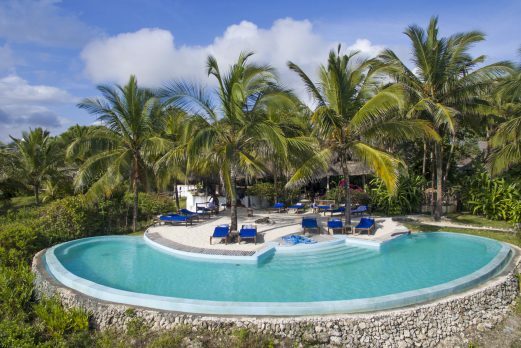 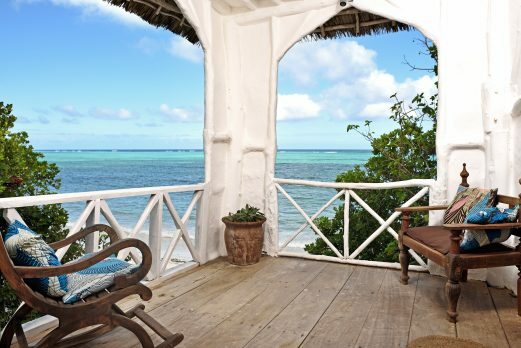 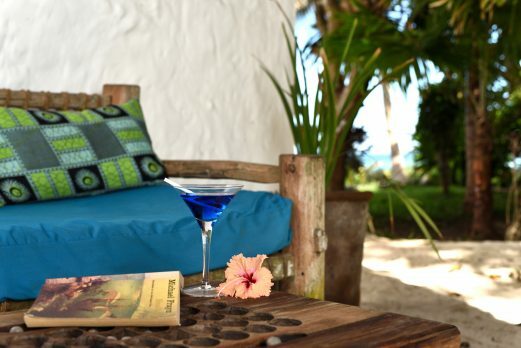 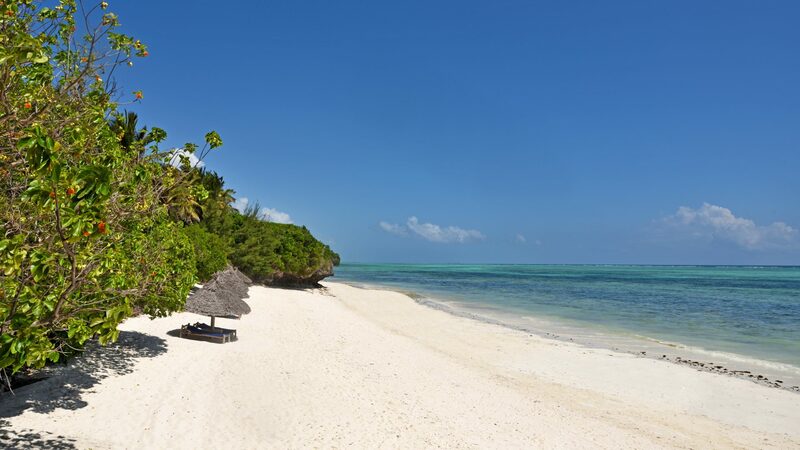 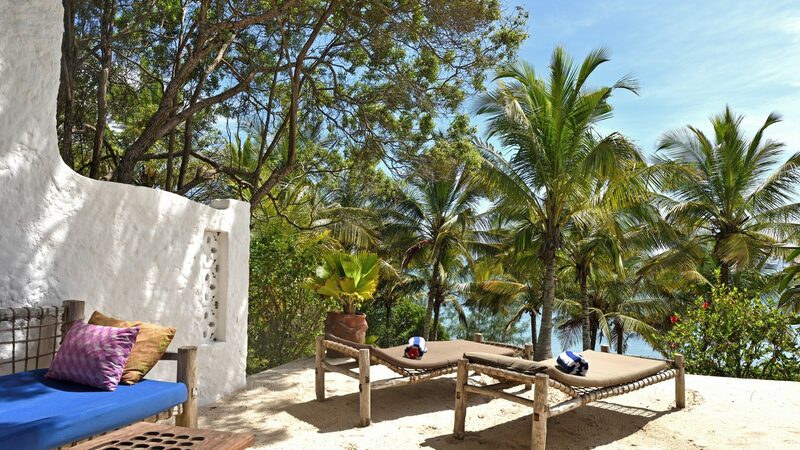 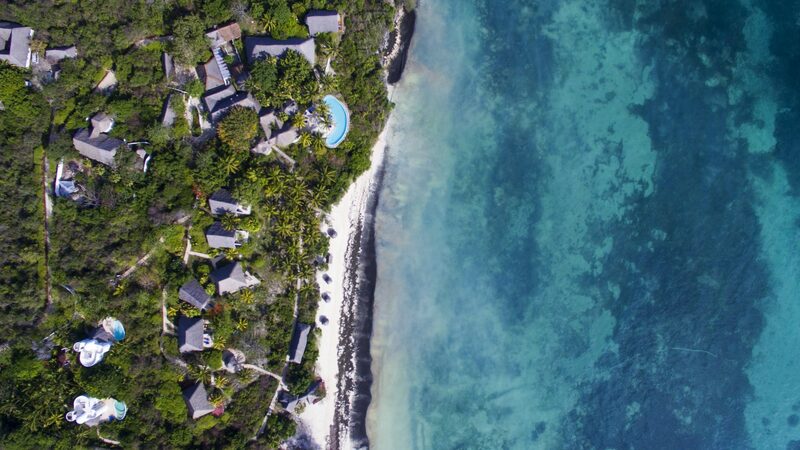 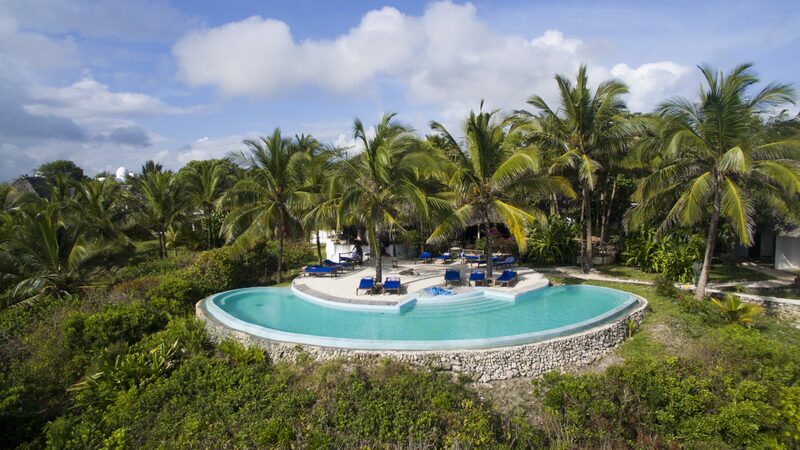 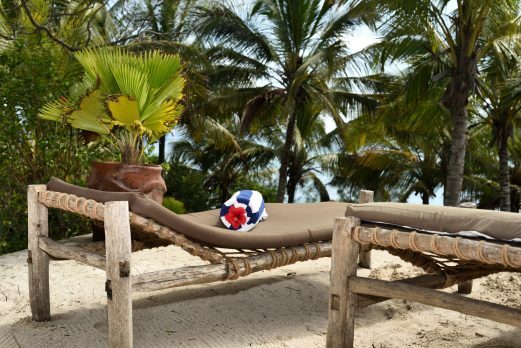 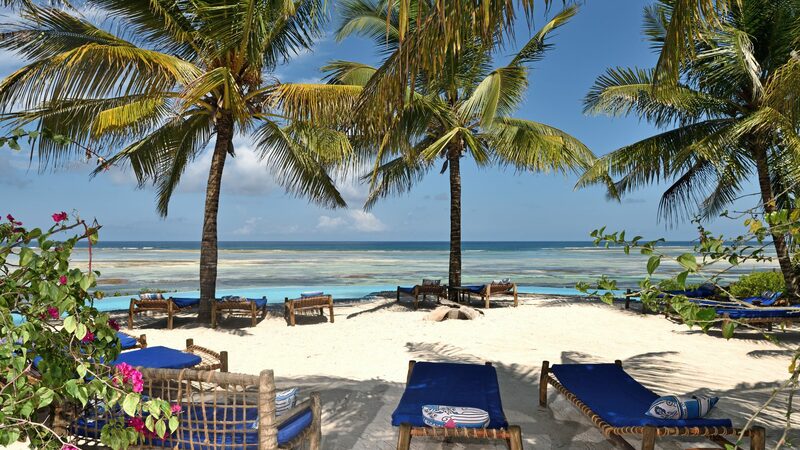 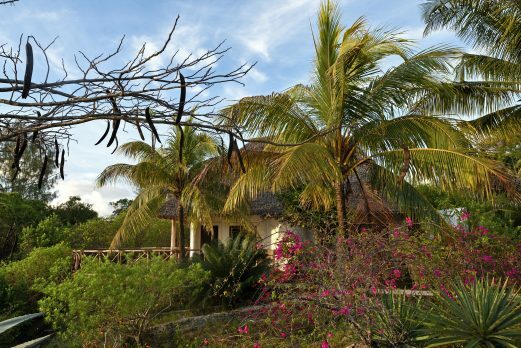 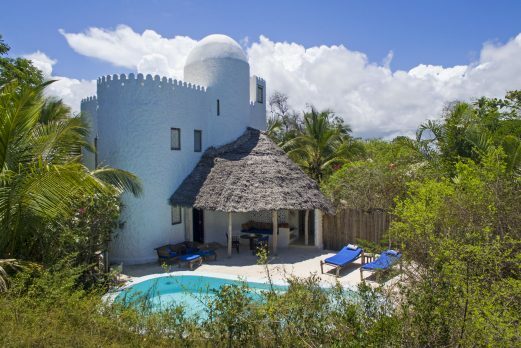 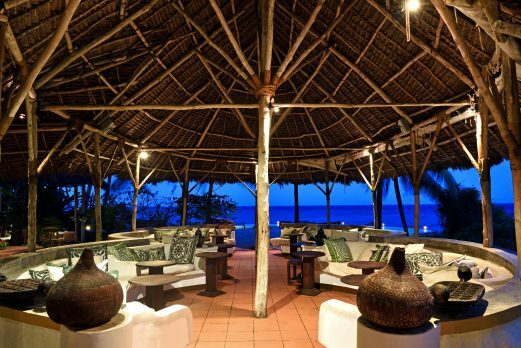 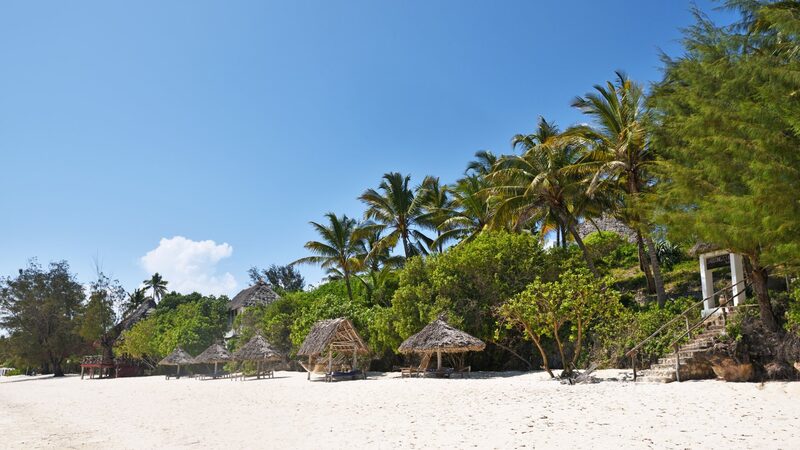 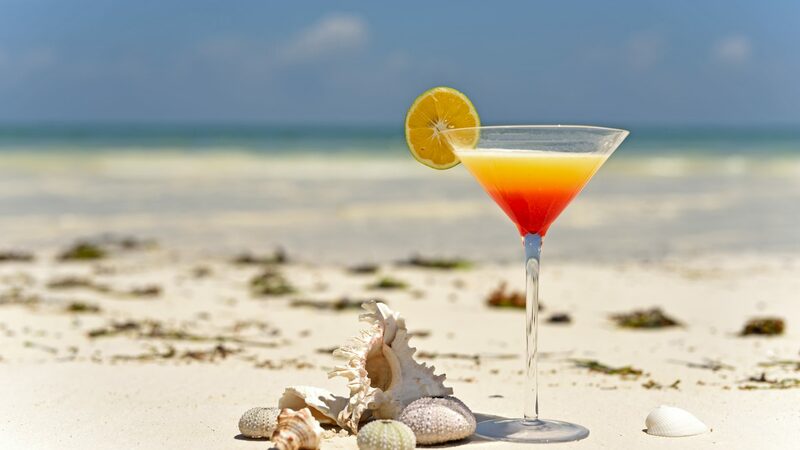 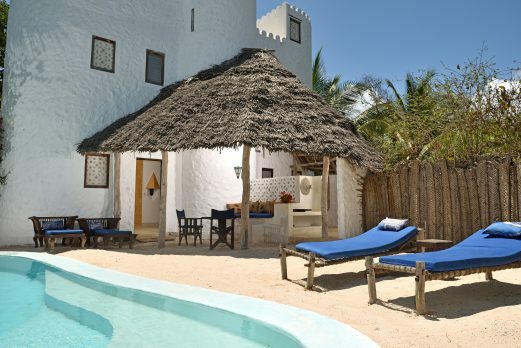 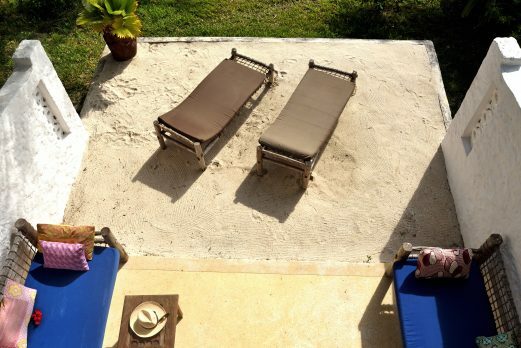 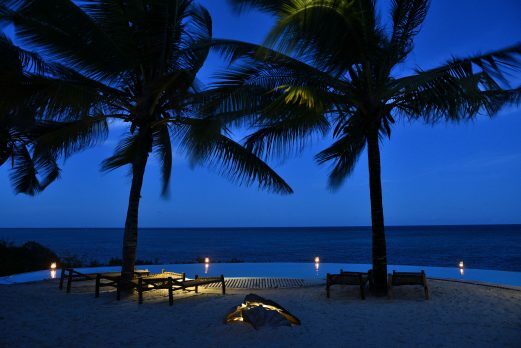 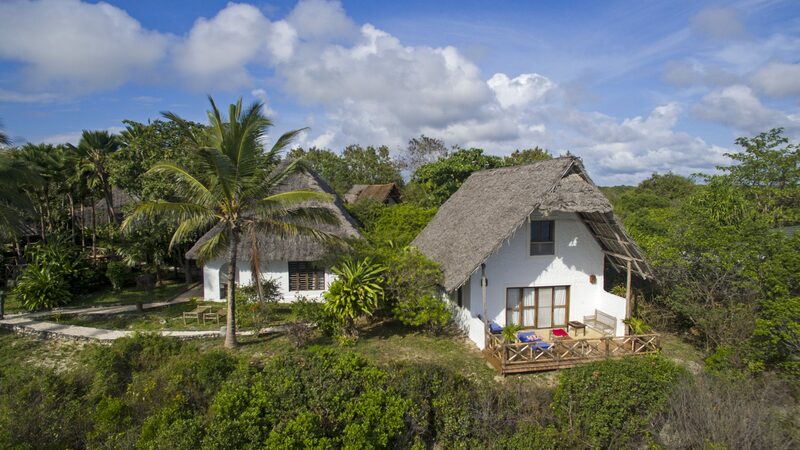 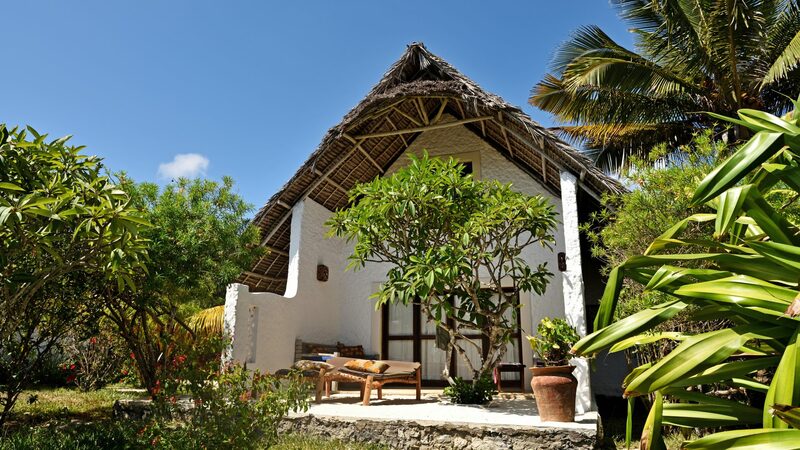 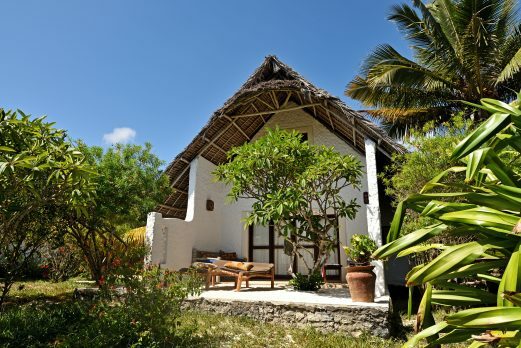 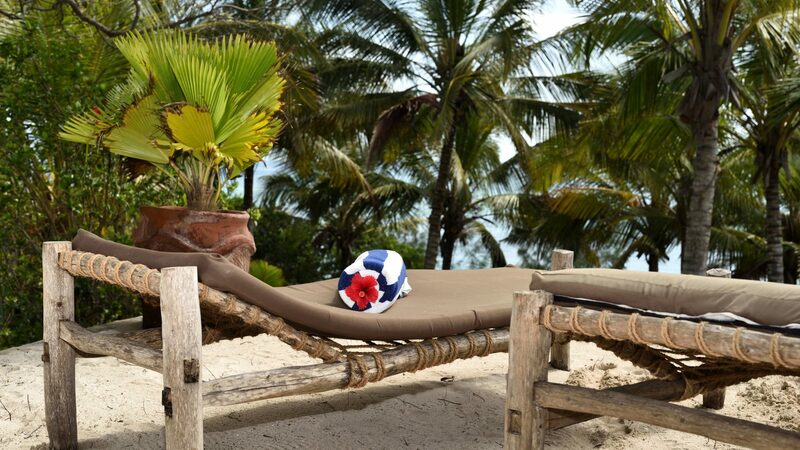 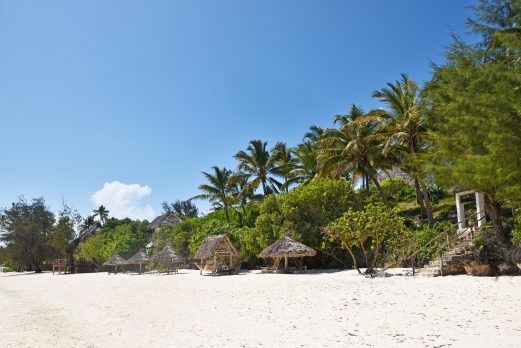 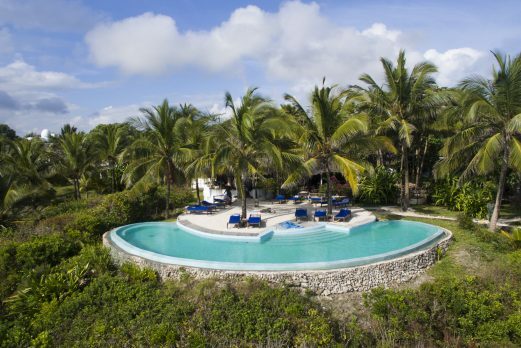 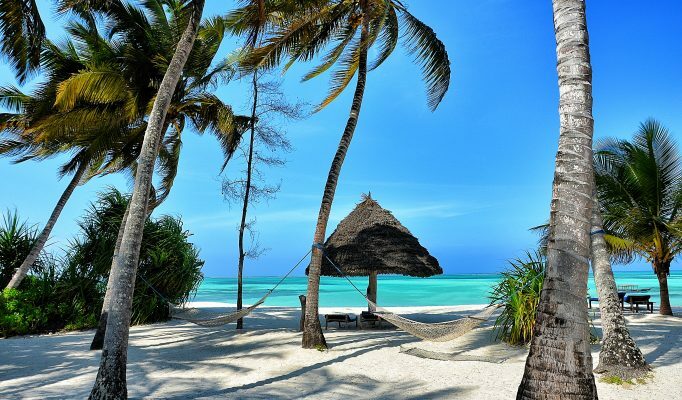 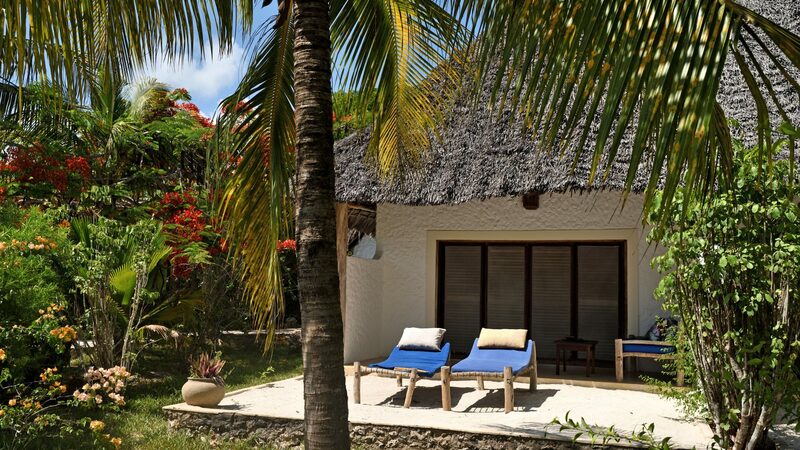 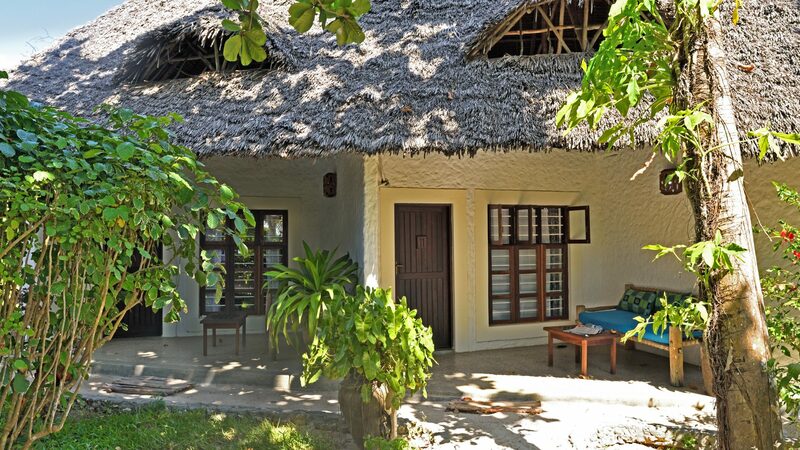 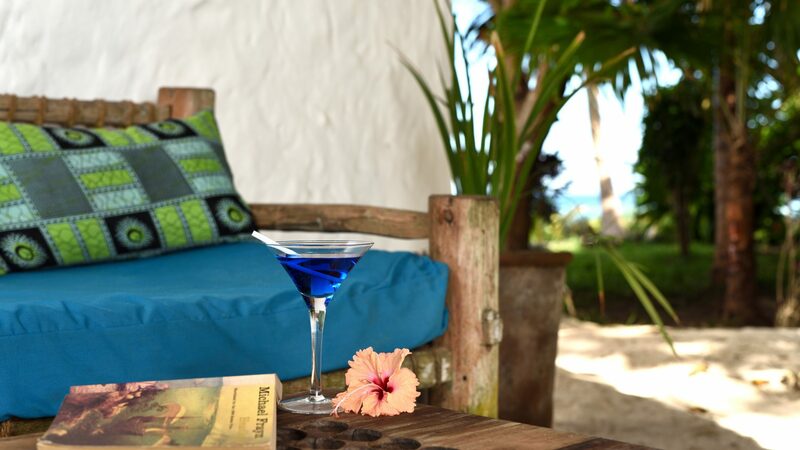 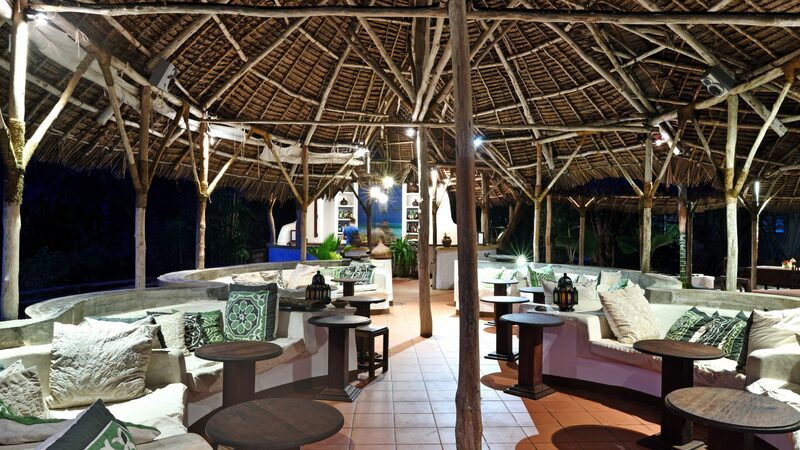 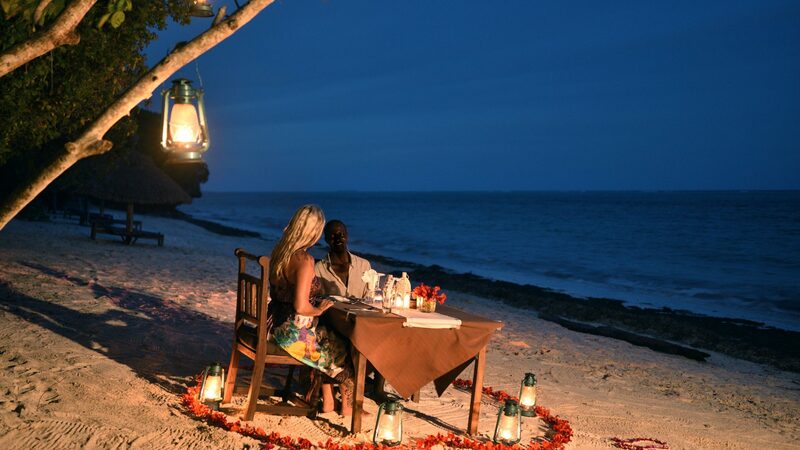 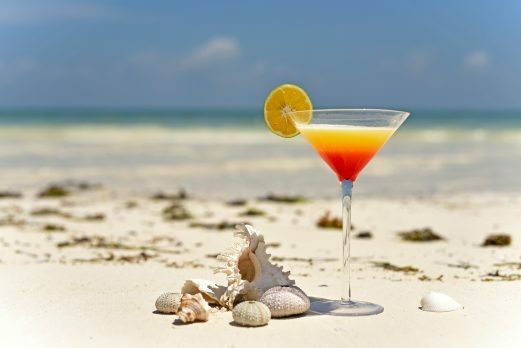 Shooting Star Lodge is a relaxed, family-run, boutique resort situated on the eastern beaches of Zanzibar. 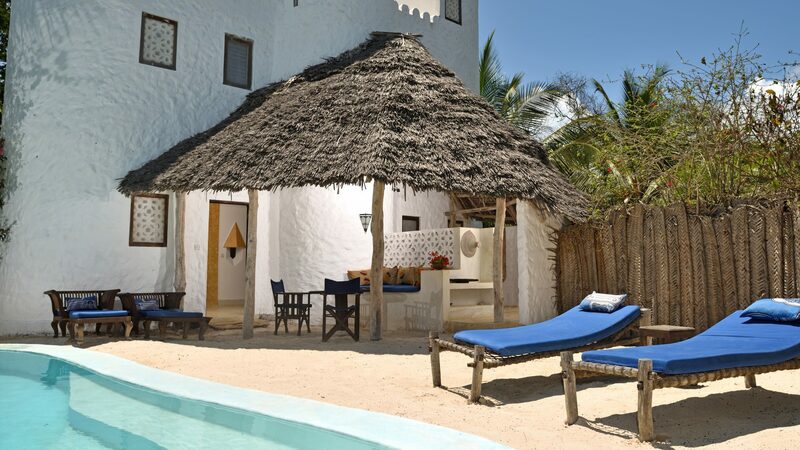 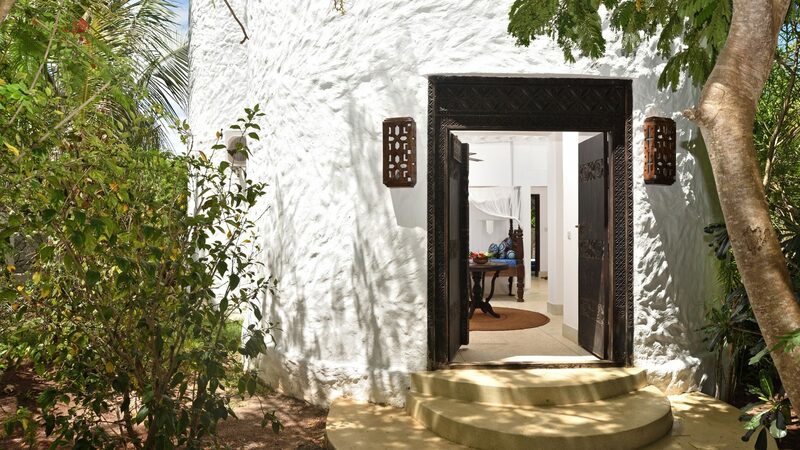 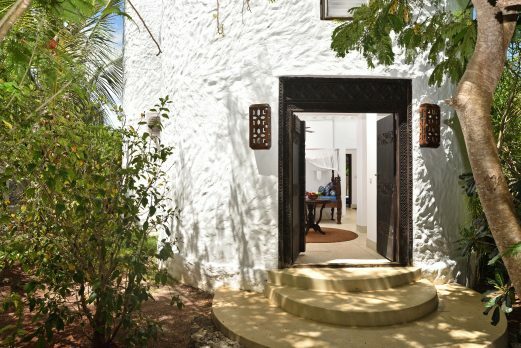 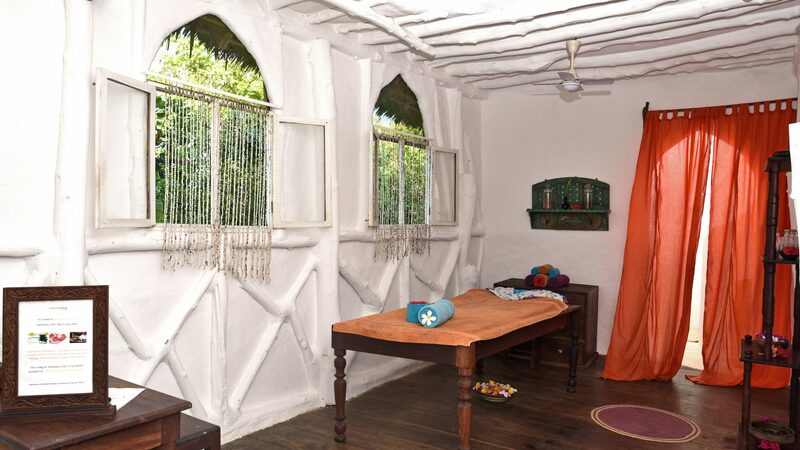 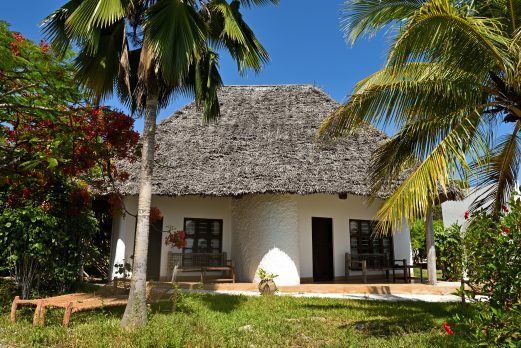 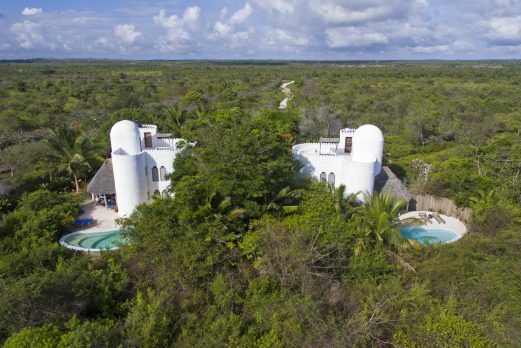 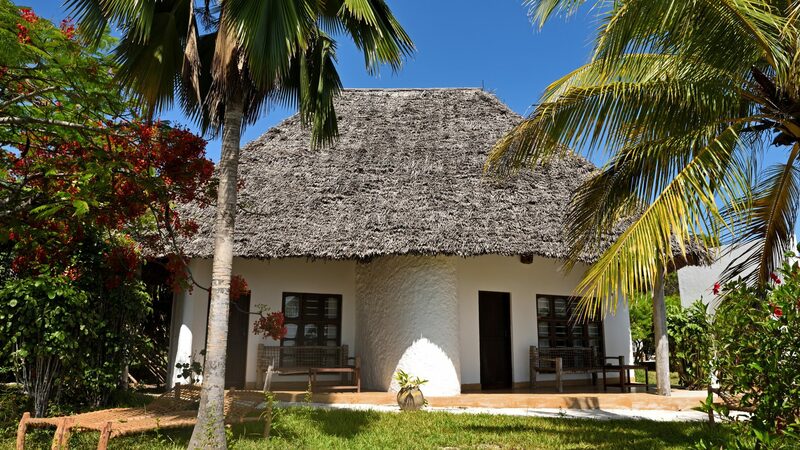 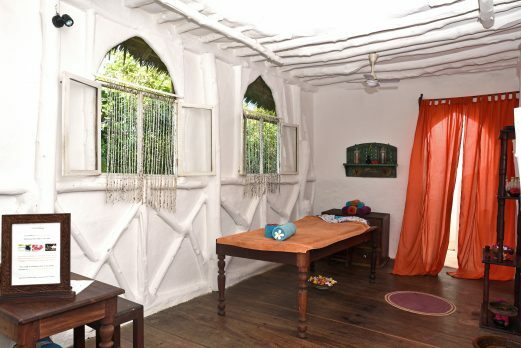 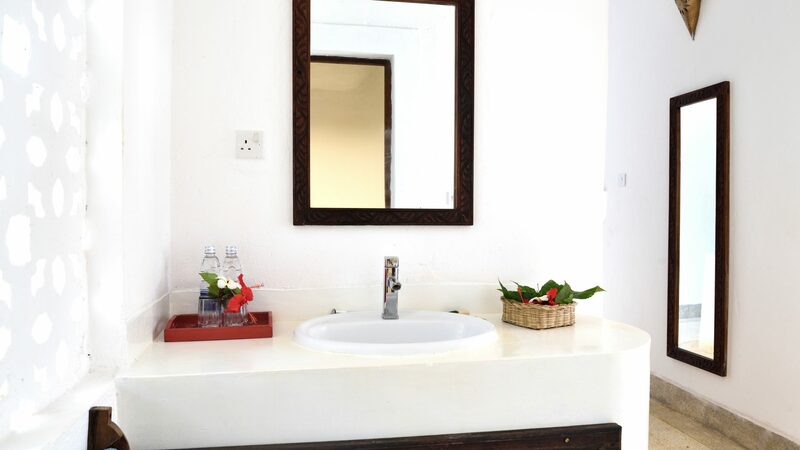 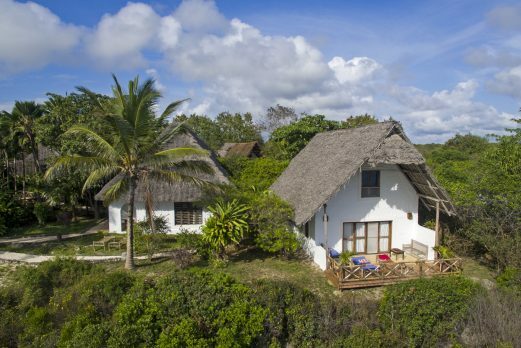 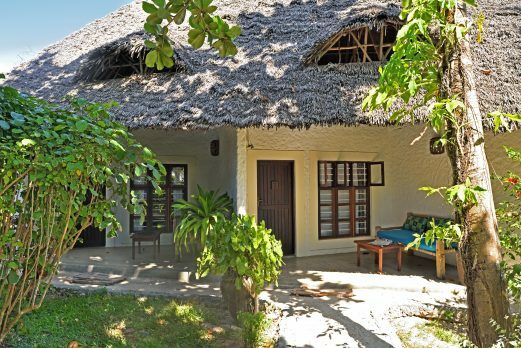 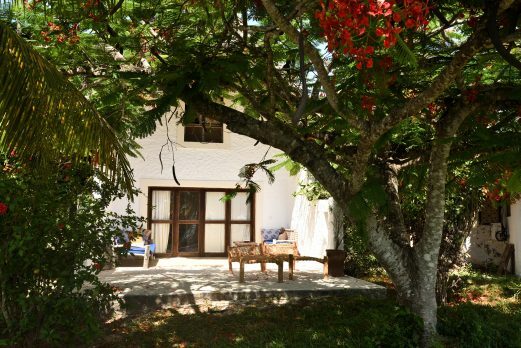 All the accommodation at Shooting Star Lodge is built to a high standard in traditional Zanzibari style, with white, limewashed walls, high beamed ceilings and large windows. 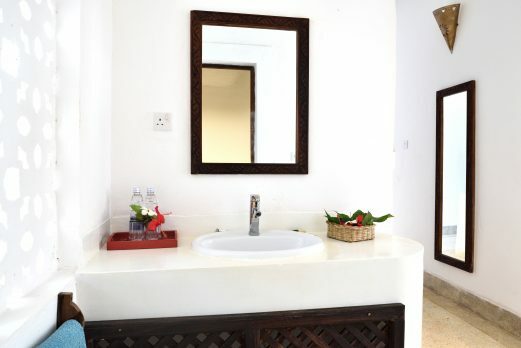 The eleven Sea View Cottages are light, spacious ensuite rooms, whilst four of them are set out on two levels and are ideal for families. 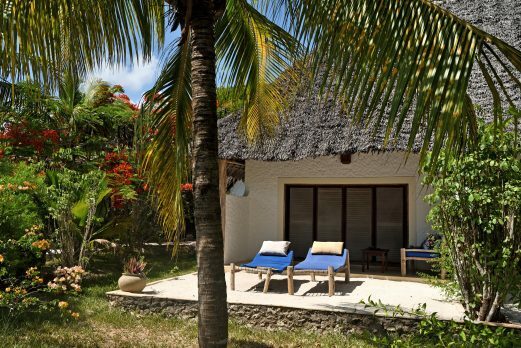 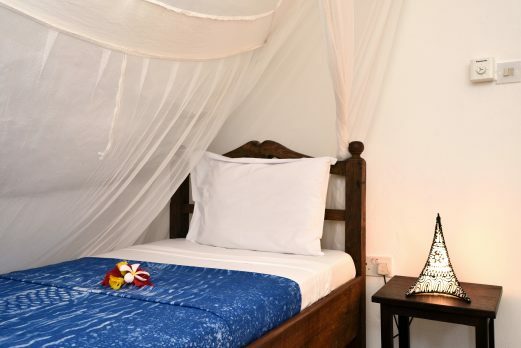 The three Garden Lodge Rooms are smaller and more simply furnished with terraces that look out to the tropical garden. 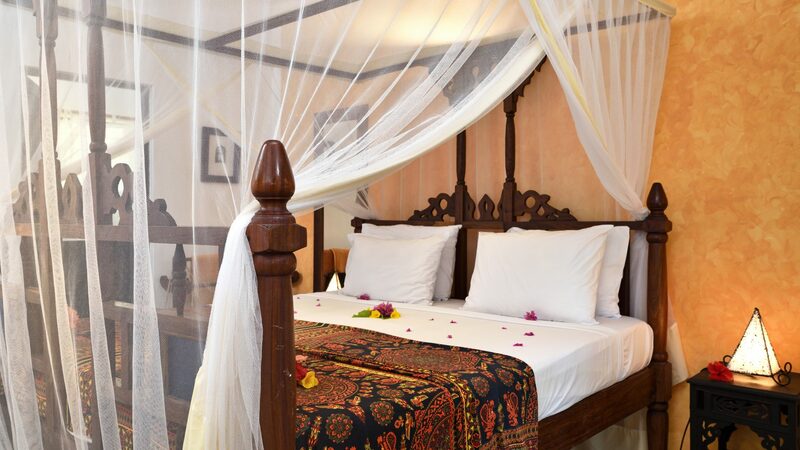 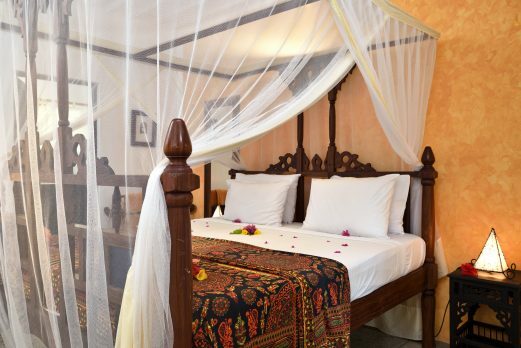 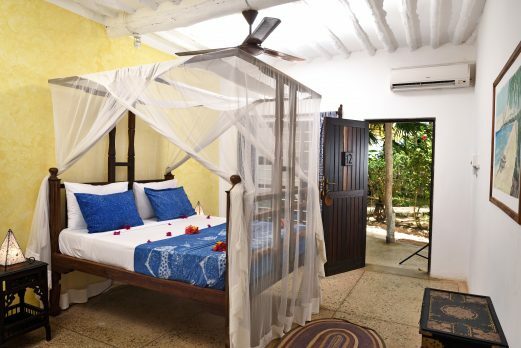 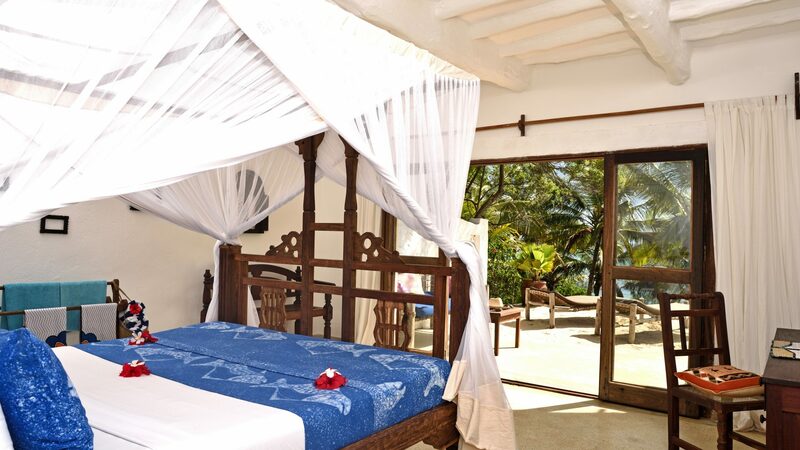 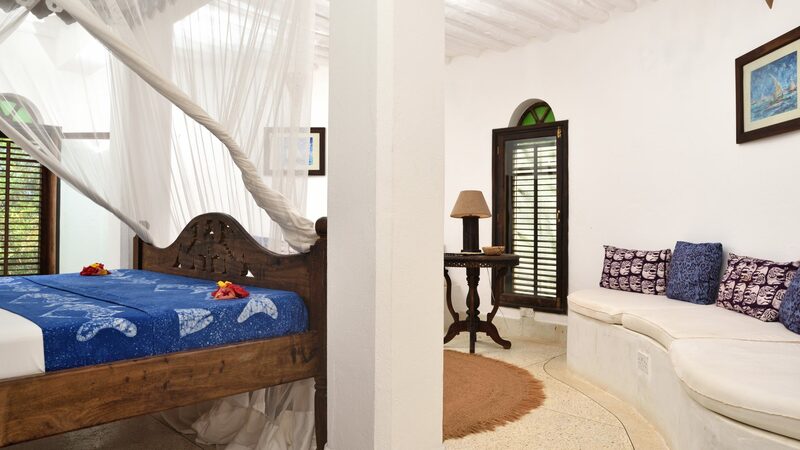 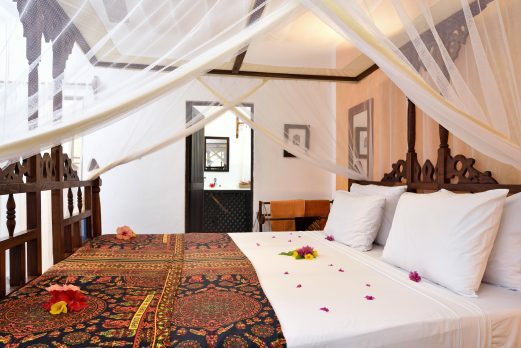 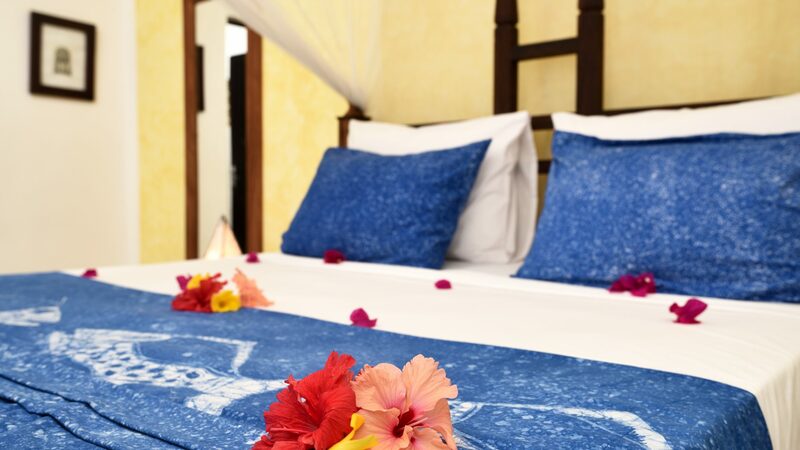 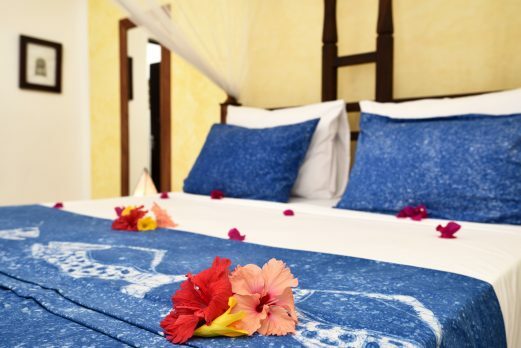 Each bedroom has traditional Zanzibari beds with beautifully dyed mosquito net canopies and matching Tanzanian ‘vintage’ batik bed covers, together with coconut wood wall mirrors and other handmade teak wood furniture. 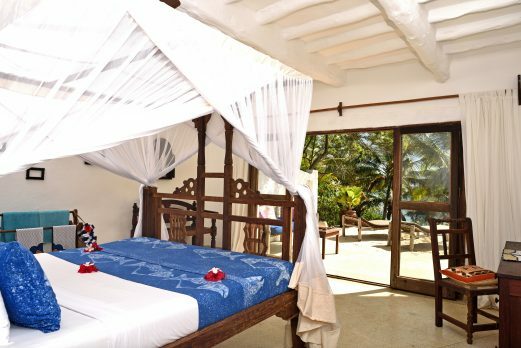 The two suites, Kusi and Kaskazi are set on the crest of the hill apart from the main hotel guest rooms. 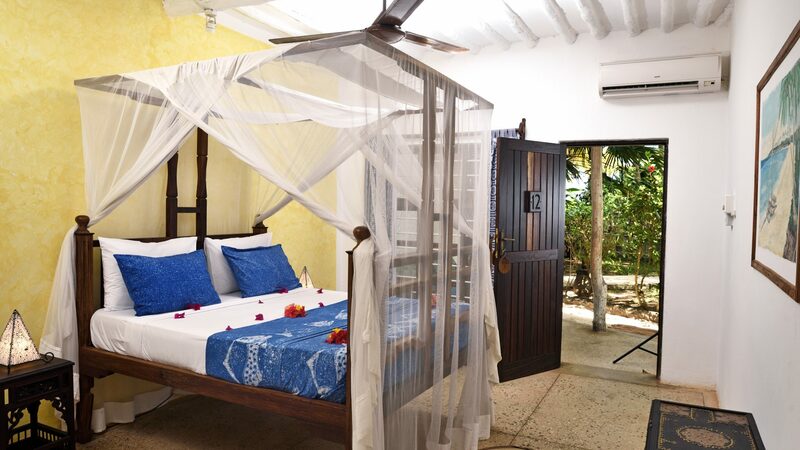 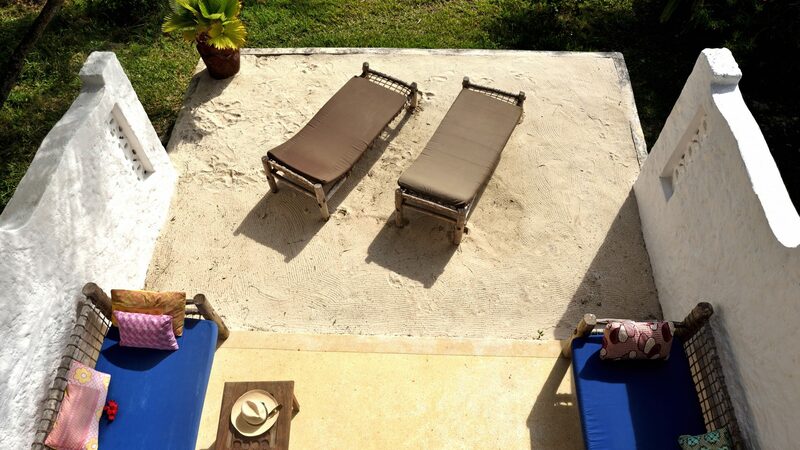 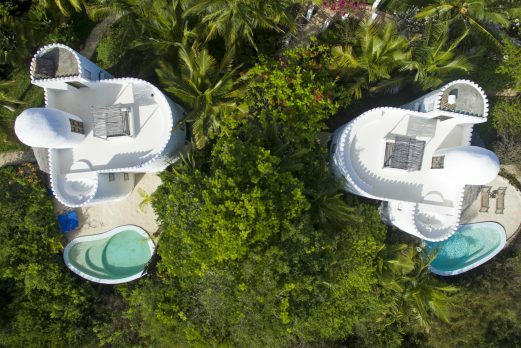 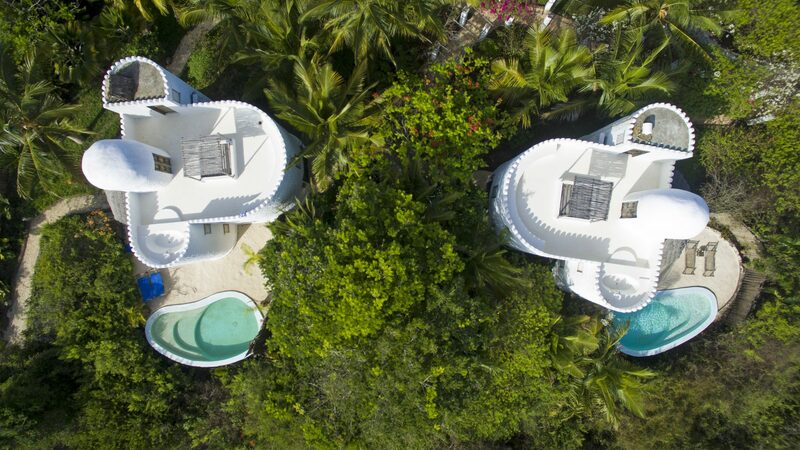 Each suite is laid out on 3 floors with 2 bedrooms and a private swimming pool set amidst a tropical garden. 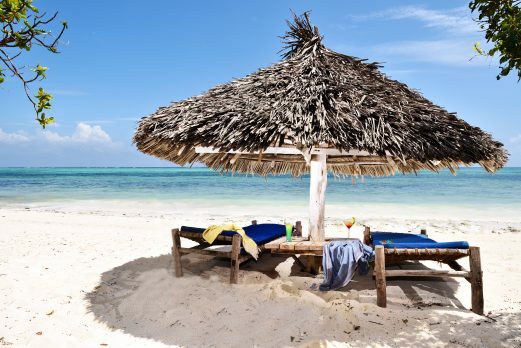 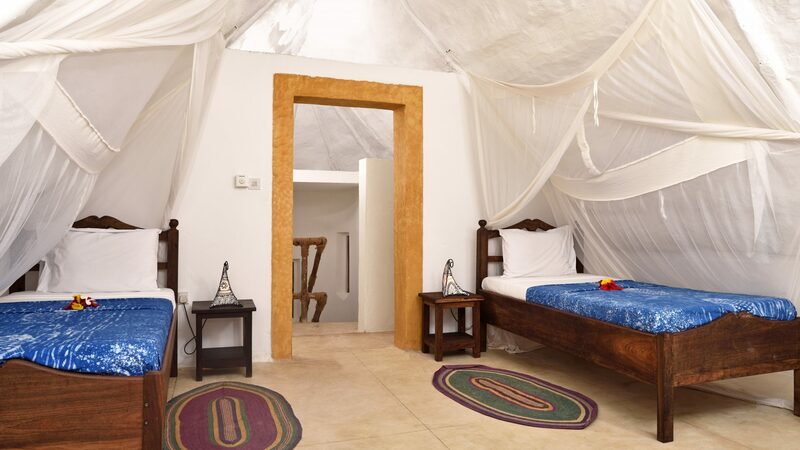 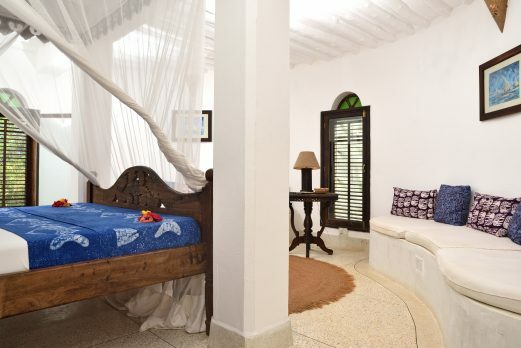 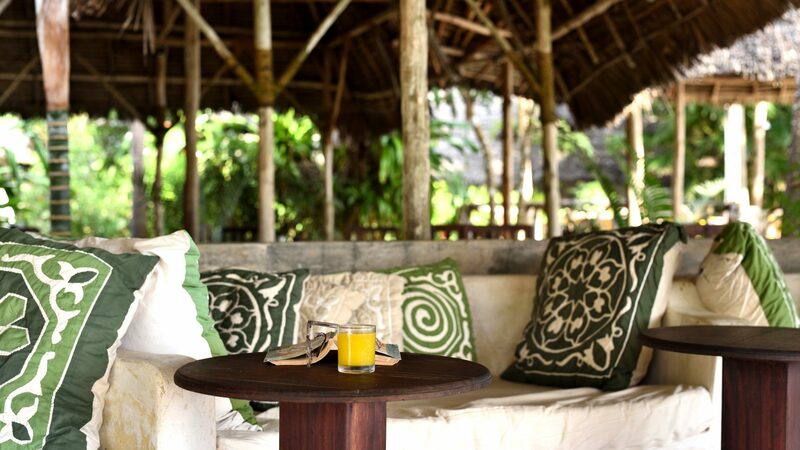 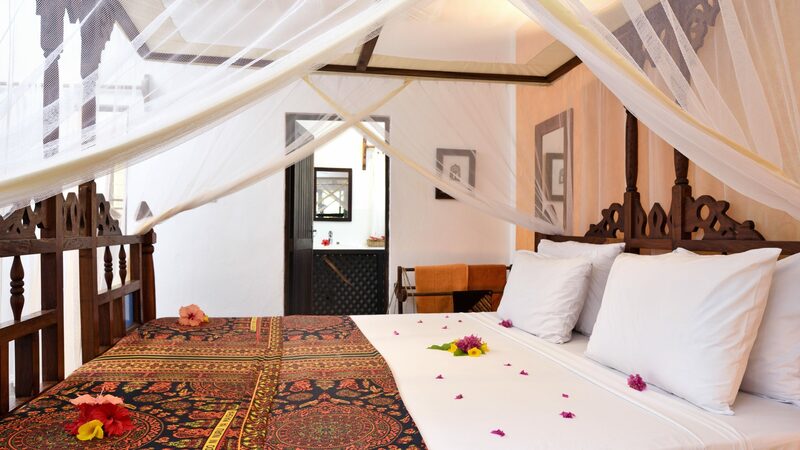 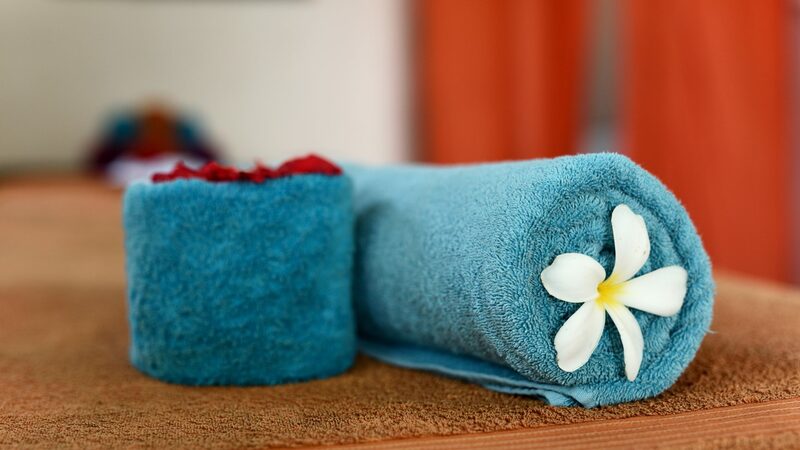 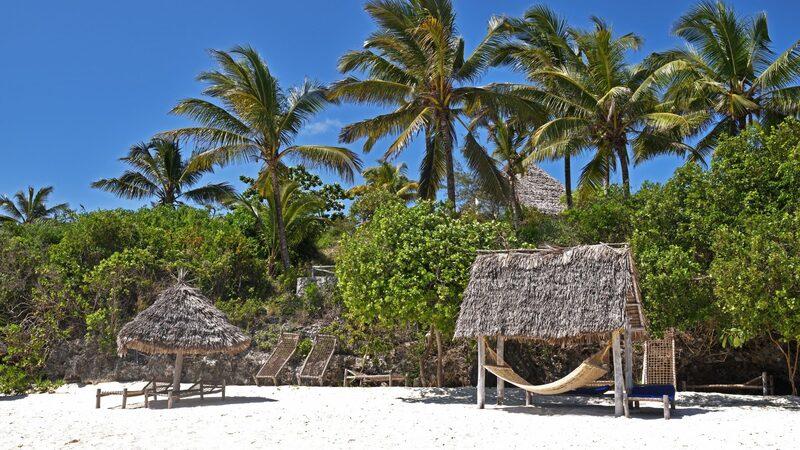 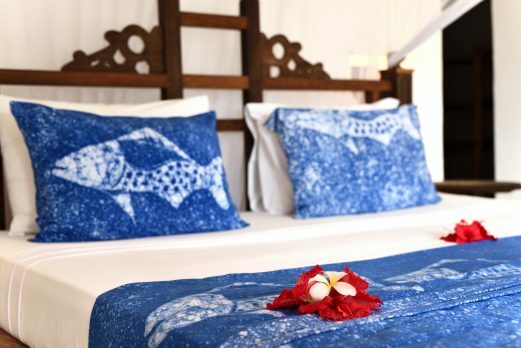 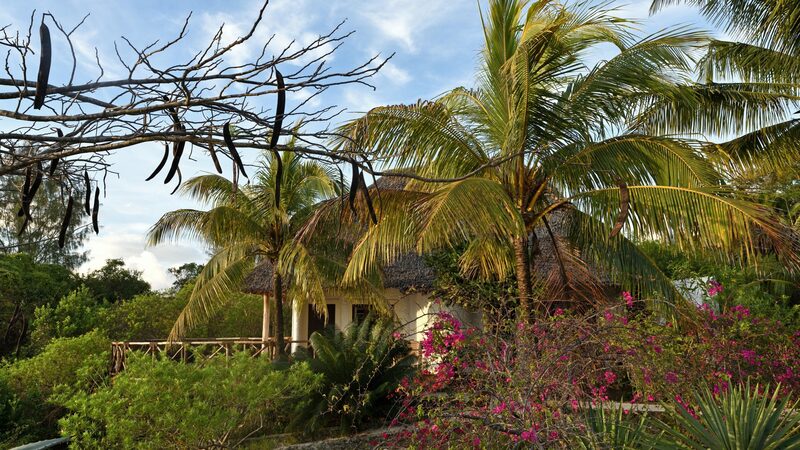 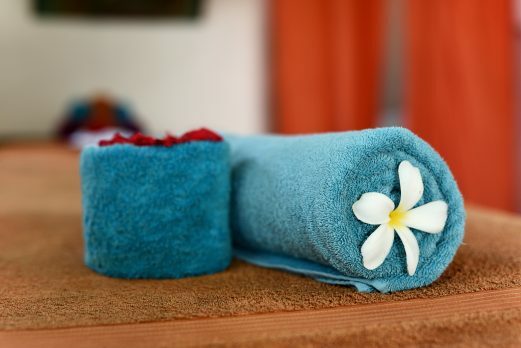 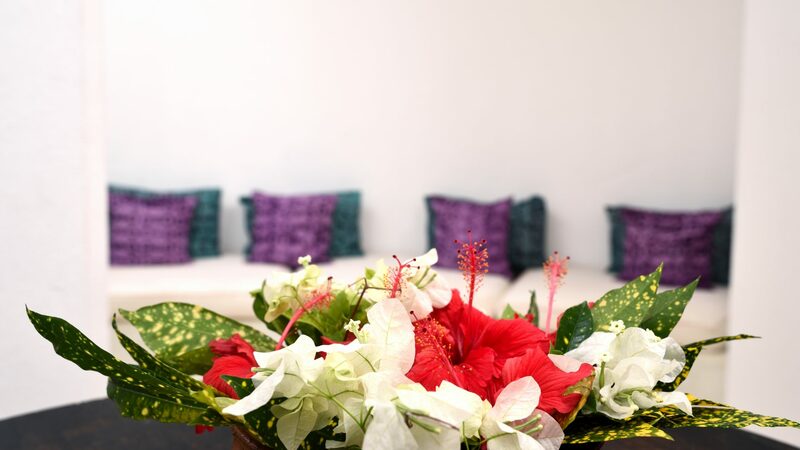 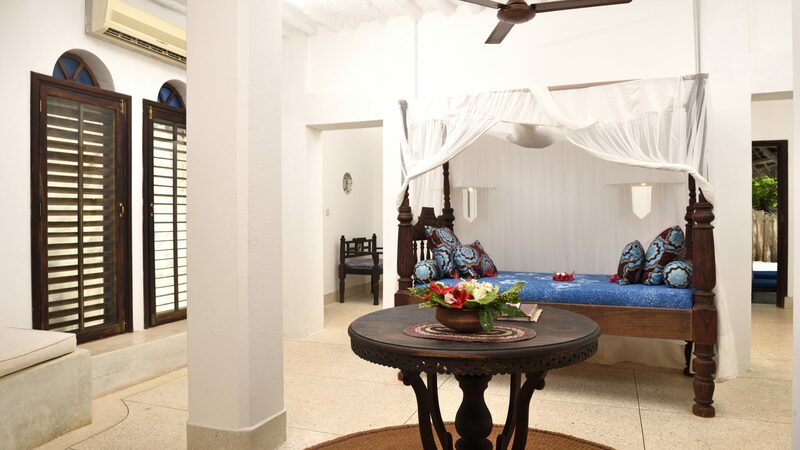 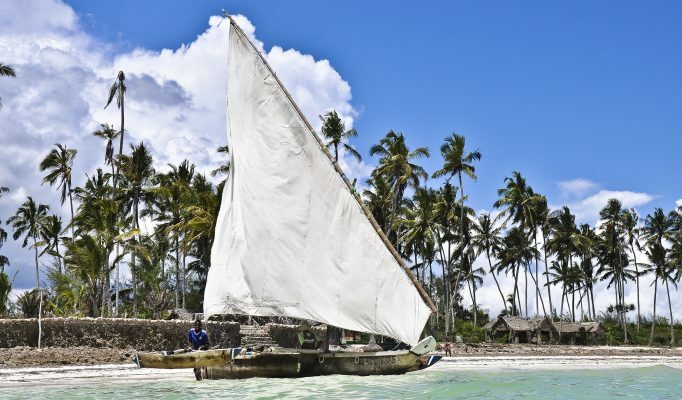 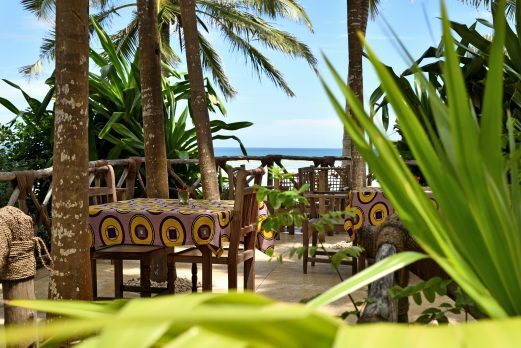 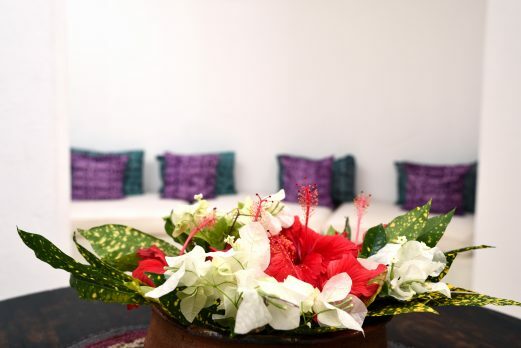 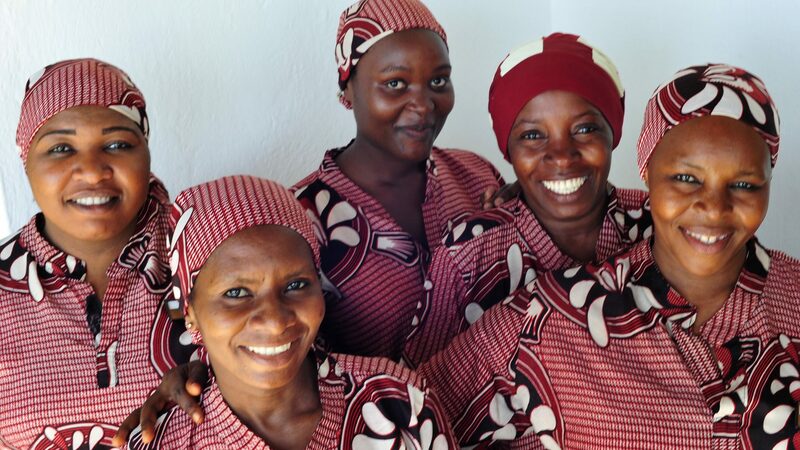 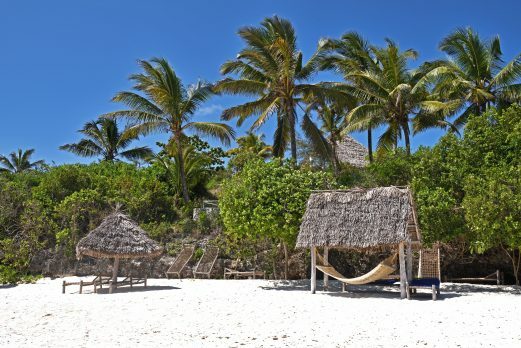 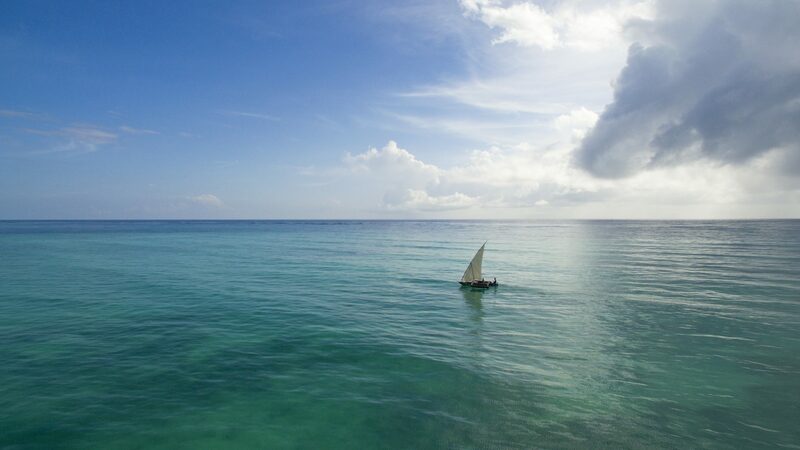 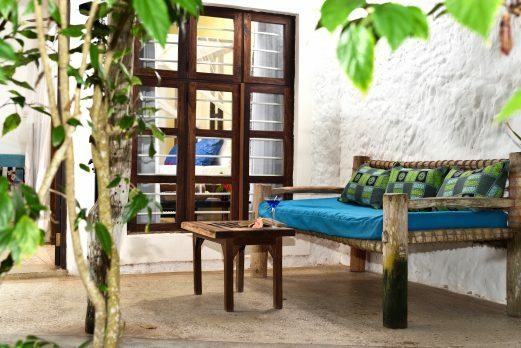 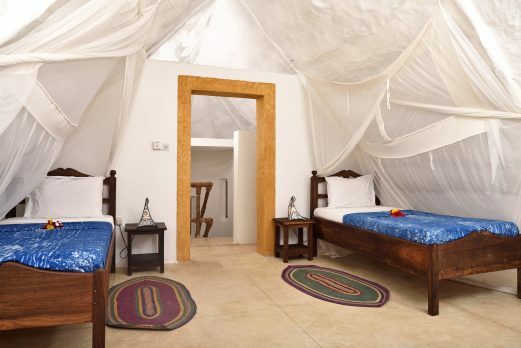 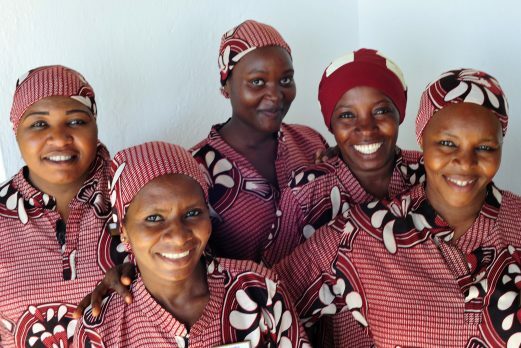 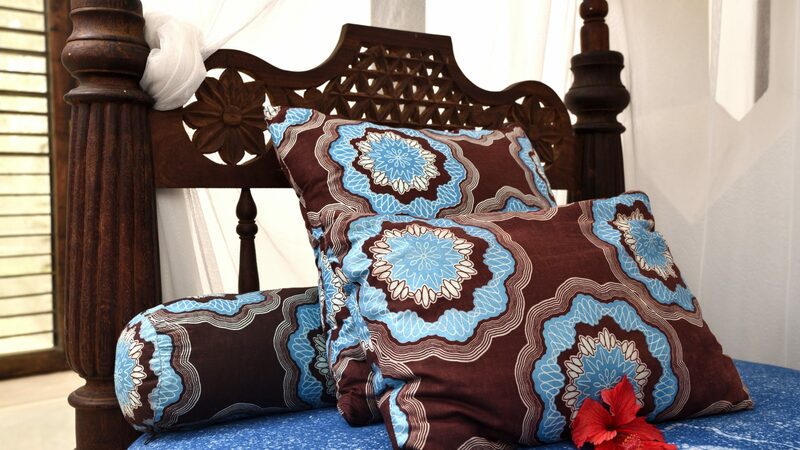 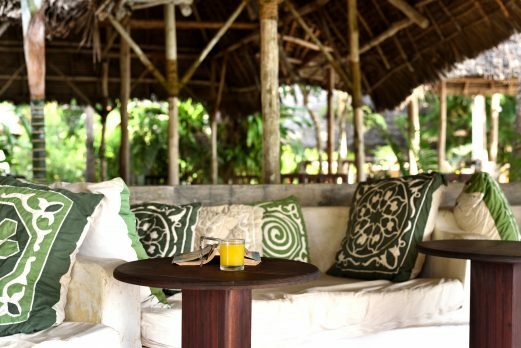 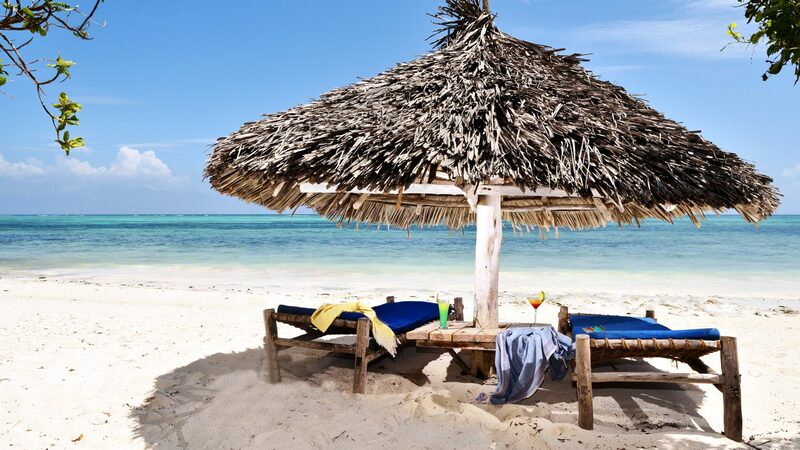 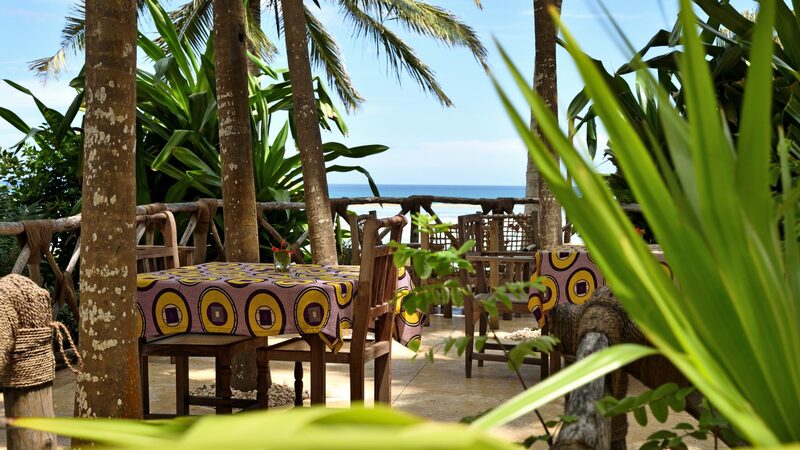 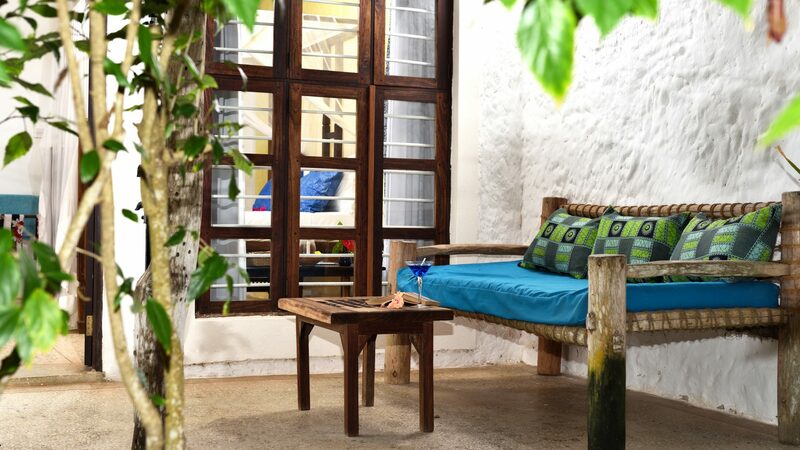 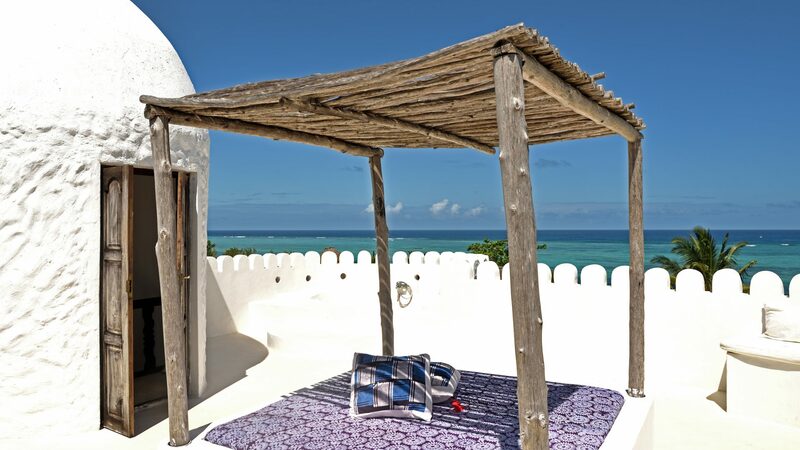 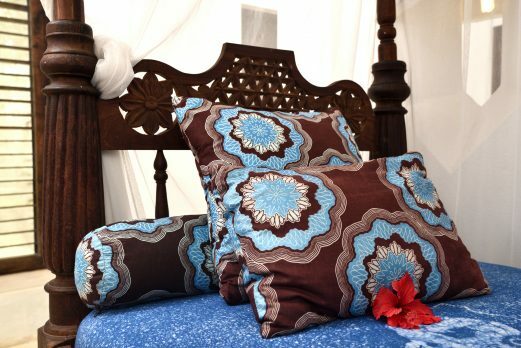 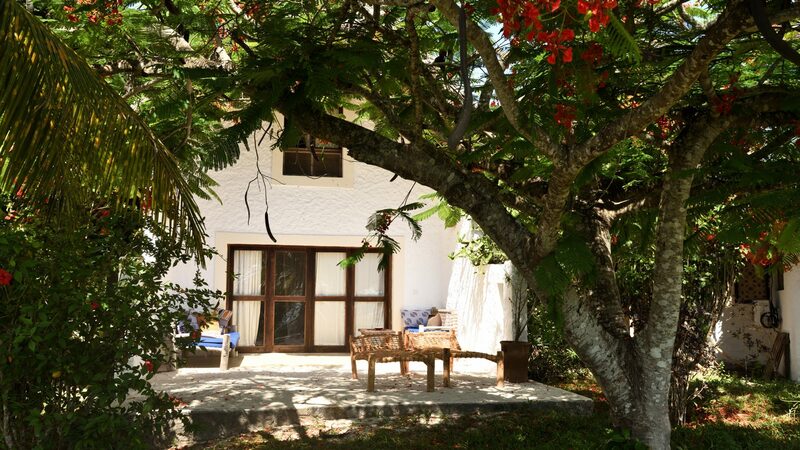 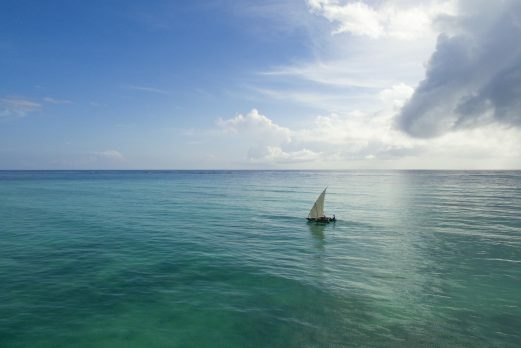 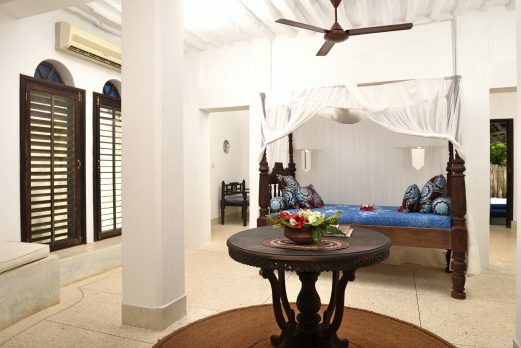 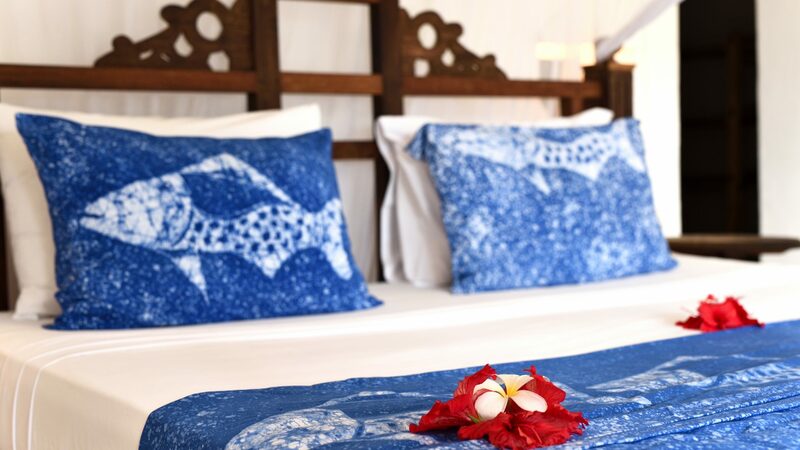 They are furnished with traditional Zanzibar furniture and batik linen. 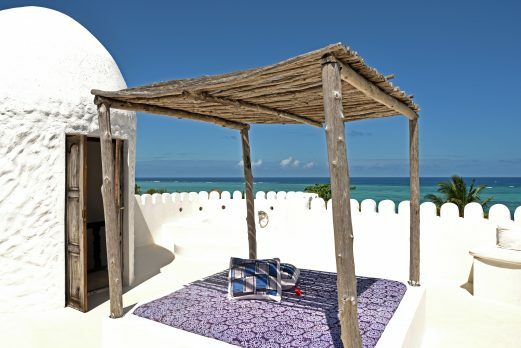 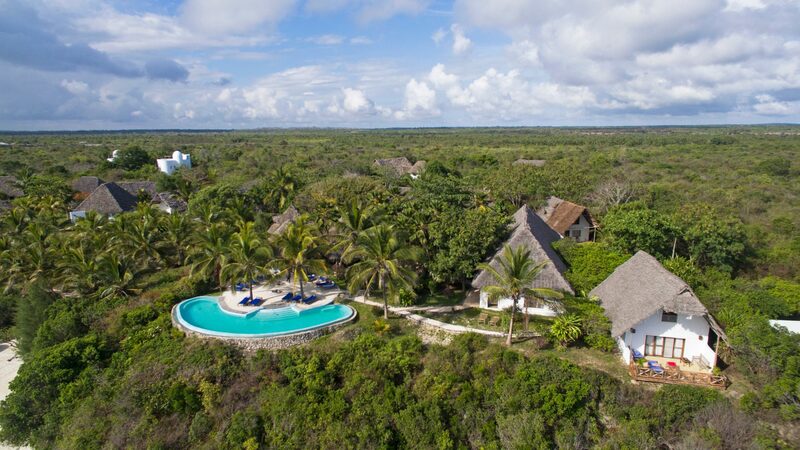 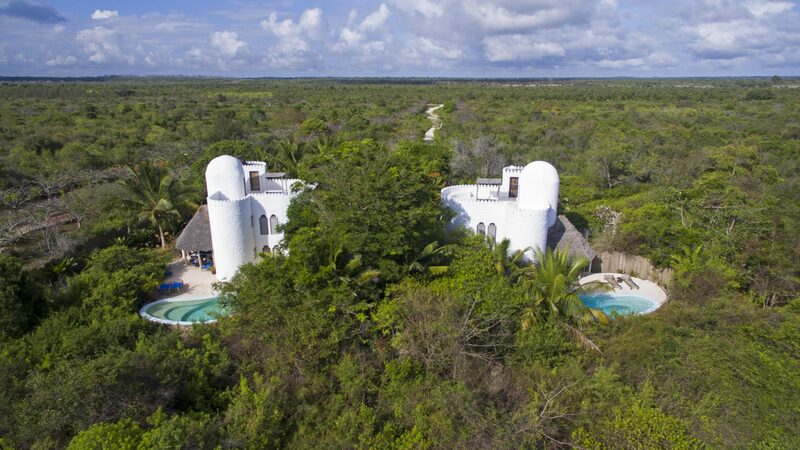 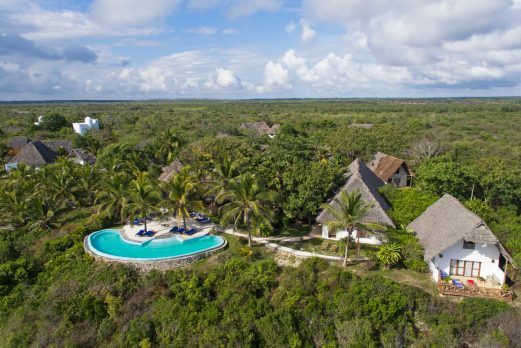 From the roof of the villa, panoramic views can be enjoyed from the bathtub and there is a fully netted bed so that the fabulous stary night skies can be enjoyed. 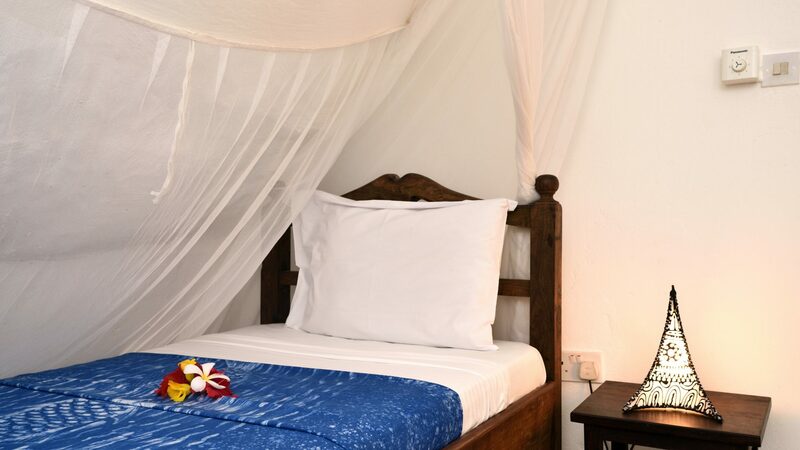 Both suites have ceiling fans as well as being fully air conditioned. 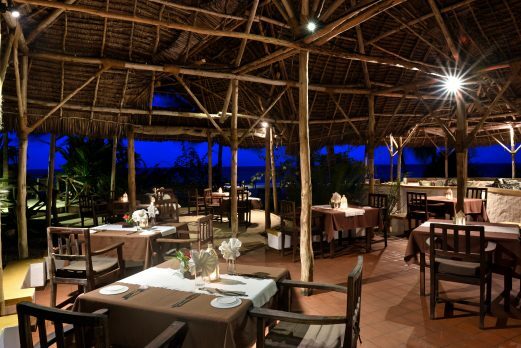 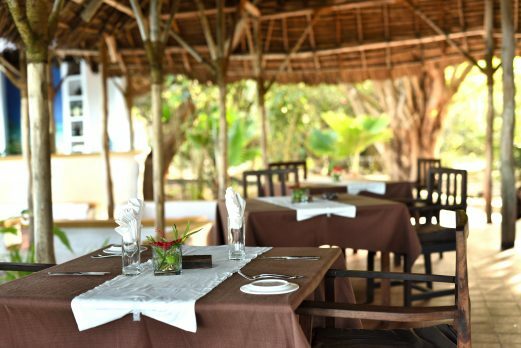 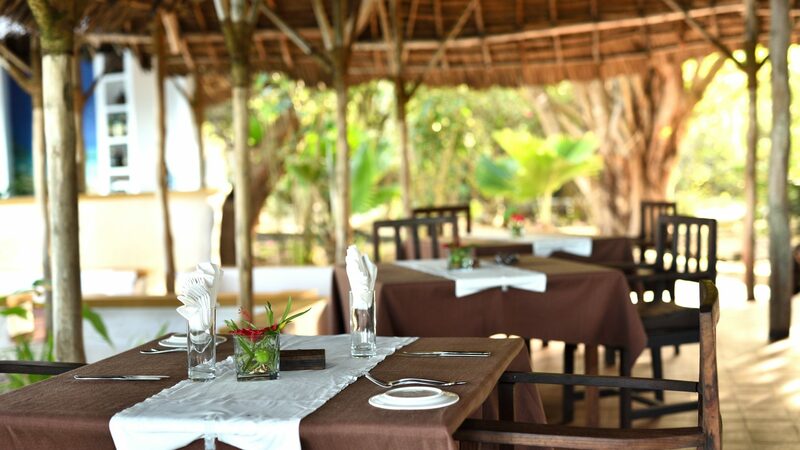 The open-air restaurant and bar is a lovely relaxed area with views over the tropical gardens and the stunning blue ocean panorama. 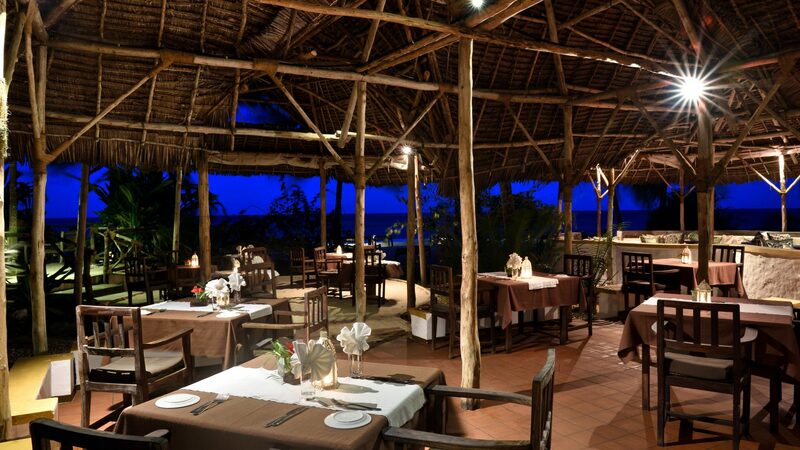 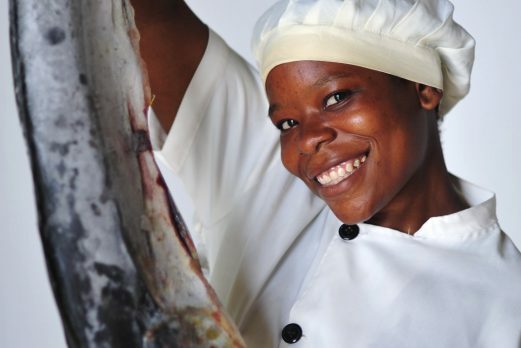 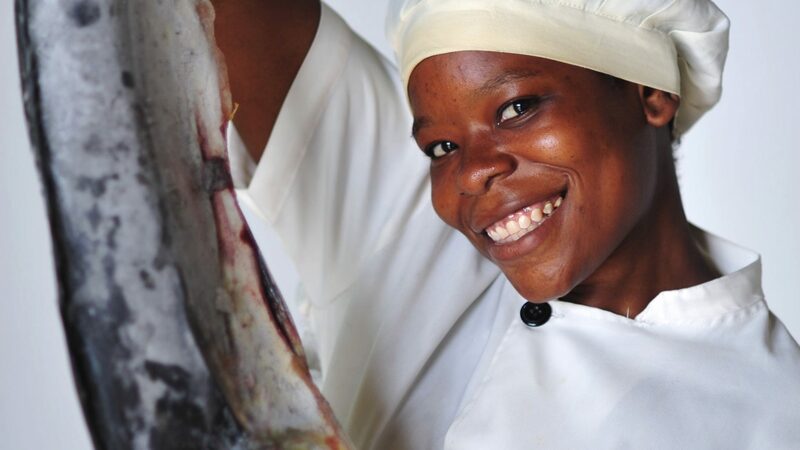 The chef serves a wide variety of delicious African and international cuisine, and specialises in lobster, meat grills and smoked fish, using traditional African recipes. 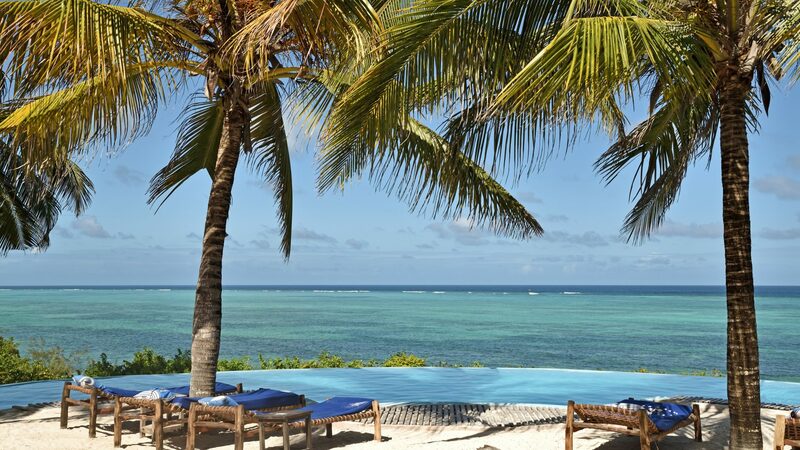 The hotel has a beautiful “horse-shoe” shaped infinity pool which sits right on top of the coral cliff with the best views from any swimming pool on the whole island. 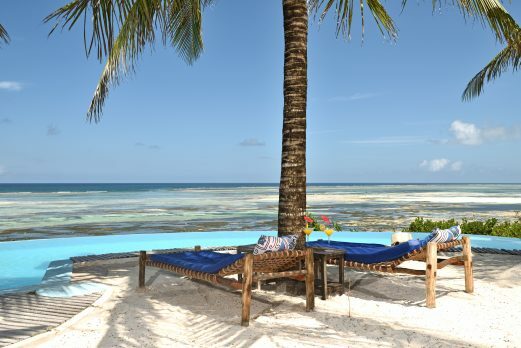 Shooting Star is a great little owner-managed beach lodge with a really relaxed and personal feel to it. A really friendly and cool place.